Running on empty but, glad to be running . . . I have been back to work full time (and then some) for about three months now. The first few months were pretty rough. But, I am adjusting and every day gets better. My stamina and energy are getting better all of the time. I am working more than full time and as a result I don’t do much else, often just working and then going straight to bed afterwards. At first this routine felt pretty grim. But, the fact that I can do it, is to me, a real accomplishment. And I feel like I am back in warrior mode – like I was back when I was going through treatment. This time is its own type of battle – just getting through the work day. As much as I am exhausted, it feels good. It is, after all, empowering to grab back parts of your life . . . even if they are hard parts. Getting the news of clear scans last week has made it far easier to deal with the physical limitations (I have a bit of trouble with my arms – writing on the board when I am teaching seems to cause some lymphedema, the daily headaches, bouts with nausea and dizziness continue – but, I now know the source is not a cancer recurrence). I am told that it will continue to take time to get past these things and that some of it just may be what I have to contend with post cancer. It was a good wake up call to go through the waiting of getting the scans and to be reminded of how much worse it could be. 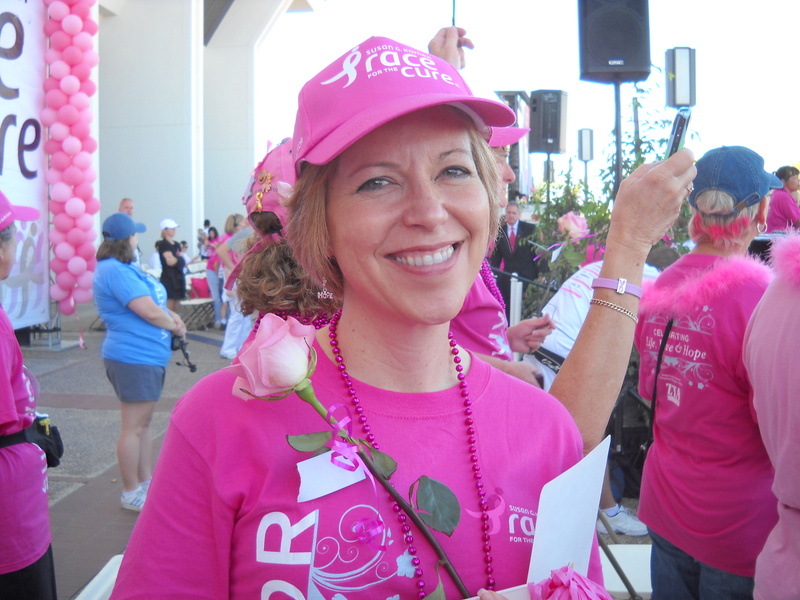 This was taken in September of 2010 at the Orange County Race for the Cure (Survivor's Ceremony). I had surgery the next day (from which I am now mostly recovered). I didn't run last year, but, hope to this year. For some time now, in between surgeries and starts and stops with medications that cause nausea and dizziness, I have gone running and walking. It has always been in short spurts – a couple of days or a few weeks of getting some exercise and then it was surgery or surgery recovery or restarting meds that sometimes physically make me feel completely upside down. It has been discouraging to get to a point physically and then feel like I am going backwards. Just this past Monday I was able to run three miles for the first time since before cancer. I don’t know if it is going back to work or perhaps just time, that has made a difference. During treatment I walked two to three miles a day on many days. But, I have not run now much in the past two years. It was a real achievement for me. I felt like more like me than I have since this whole thing began. My body is so different now. Of course I look different – I am scarred and have had parts removed and parts recreated from silicone and flaps of skin and muscle taken taken from my back. But, it is far beyond what I see in the mirror that is different. There is not a moment that I am free from feeling my breast cancer. It is a place I actively work hard at not going – to cancer, thoughts of it, worries over it, anger, etc. But, every time I reach for something I feel the pulling in my back, the movement of my rebuilt parts and the pain that shoots around my back, underarms and chest. I am always uncomfortable. And, the weird thing is that over much of this area of my body there is numbness and lack of feeling. Yet somehow, my body makes sure that I still feel pain in these areas. It is odd. But, I am here. And on Monday I ran through all of that and felt like I didn’t have cancer. The run was tough like it always would be tough the first time running that far (like BEFORE cancer). It did not feel any tougher than that – than what I might have experienced in getting back into running prior to having gone through cancer treatment and surgeries. So, that is truly something. Now, today is Friday and I have not been able to run since. The three miles proved to be a bit much and I have been pretty sore since. But, it is better and I will go out and run again as soon as I can. I am encouraged that I was able to do it and believe that I will eventually get back to doing many of the things that I used to do before. 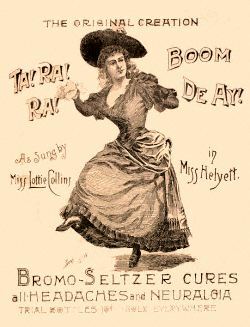 Maybe all I need is some Bromo-Seltzer . . .
Unbelievable. I just got my results from this mornings scans (yes, from this morning) and the results are great: no evidence of metastatic breast cancer, no changes from the prior clear scans. So, needless to say, I am pretty relieved. I have been having a lot of headaches, okay, pretty much every day and all day since November. I thought it was probably from work or residual from treatment perhaps. But, my oncologist was a bit worried and consequently so was I. We don’t know the reason for the headaches (although I am thinking that it is just my body taking a lot longer to get back to things full force than I would like it to). I have pushed myself a lot and I feel as if I could just take a couple of days and do nothing that I would probably feel a lot better. In any case, having clear scans makes me feel SO much better . . . what an incredible relief. Thank you so much for your prayers and positive thoughts (and Sandy – for the Reiki). I greatly appreciate it. I am so grateful for you all and for the love and support I always feel from you all. Scans tomorrow . . . Tomorrow I will have scans. I check in at Hoag at 9:30 am, tests to begin at 10:00 am. I should be be done by 12:30 pm. I have been very anxious about having scans. And, while not really planned, I have been keeping a low profile (sorry, I have been doing pretty much only what I absolutely have to do and not much more). It has been very busy the past month or so . . . now back to work for the first time full time in a long time. It has been an adjustment. But, it is coming along and for that I am glad. So tomorrow’s challenge – aside from just getting through the scan experience – is getting through the IV placement for the brain MRI. My veins were always an issue during chemo and Herceptin infusions (treatments ran double time because my veins were small and as a result could not handle the average infusion rates). I am anxious about the IV and whether they will be able to successfully place it and that my veins will hold up. And, I am concerned about the results. I am obviously hoping that everything goes well and that I get good news. This stuff is draining. There is a fear that accompanies these tests that can be paralyzing at times. So, hopefully all goes well. Please say prayers and/or send positive thoughts my way. I greatly appreciate it. I am waiting to get authorization for the scans that my oncologist has ordered. Things are taking a bit longer because my oncologist is out of network and so her requests apparently have to be run through my primary care physician who is within the network. I have not had to deal with this before . . . I simply scheduled the tests or scans that my oncologist ordered . . . the authorizations would come in the mail later and I went ahead and had the exams. I am tempted to just go ahead and get the scans without waiting for pre-approval. Both of my doctors are concerned about waiting on the scans. There is also the issue of when I can schedule it – I can’t really skip teaching a class and I don’t want to have scans on the same day I am teaching. I had arranged my subject coverage in such a way to make this week a light week so that I could get things outside of class done without having to juggle extensive class prep with medical stuff. I still find that I have a limited amount of energy each day. It is getting better for sure. But, I have to really gauge how much I plan to do for each day and it is not always easy to figure out what is reasonable for me to be able to get done in a day. This is a bit frustrating. On most days I am behind the eight ball. I definitely feel overwhelmed as a result. But, hopefully this will improve. I am nervous about the scans and MRI. It makes me nervous that I am in pain every day. I am on Tamoxifen now and it can cause bone pain. So maybe the pain is from the Tamoxifen that I am taking. Hopefully I will get good results soon. Please say send positive thoughts and prayers out my way, I greatly appreciate it. Looking forward to a break . . . I am super tired. It is 8:30 and I am still working, getting ready for teaching tomorrow. Tomorrow will be the first long day of teaching I have had in a while. I am looking forward to being done with class. I have three student meetings (one over lunch and the other two after class). It is too much for one day . . . but, I did this to myself. I will get through it . . . and I am determined to enjoy the day. But, I definitely need to be more careful in the future to not schedule so much. I love teaching and I have a really nice group of students this year. All very bright, conscientious and even appreciative. It makes class a lot more enjoyable. Well, I guess I need to get back to it. I can’t wait to be done with work tomorrow. I am looking forward to really taking it easy on Sunday. P.S. The article links below have nothing to do with anything in particular . . . the blogging platform I use automatically generates “related” articles. Sometimes the articles are related and sometimes the articles are not so related . . . today’s are not so related . . . but, might be interesting . . . Hoping for sunny skies ahead . . . I met with my oncologist today. Everything went as expected. She was concerned about the headaches I have been having and has ordered a brain MRI. I will also have a routine chest CT at the same time (at least I think it will be done on the same day, not sure about that). But, in any case, I will get both done very soon. I am not surprised by any of this. But, it is a bit sobering. And, pretty damn scary. I hate this stuff. I don’t know anyone who likes it, so that is kind of a stupid thing to say I guess. But, I really do not like it. In my appointment today Dr. Hurvitz asked me how long ago the headaches started . . . when I answered her she winced. That was not especially comforting. But, I know that she can not give me any definitive answer about what is causing my headaches without having results from scans. Obviously I am hoping that everything comes back clear. My Dad drove me up to Santa Monica today for my appointment. I was going to drive myself up there. But, my Mom thought it would be a good idea for my Dad to take me today. She was right. I would not have had a very good ride home today if it were me driving home alone. My Dad and I had lunch together afterwards and now I am home alone and it is sinking in . . . the worry on my oncologist’s face. Damn. I saw her nurse as I was walking out of the exam room. She asked how I was doing and I told her . . . apparently everyone knows what having headaches potentially means. It makes me feel kind of stupid now. I mean I don’t think I delayed in bringing the headaches to her attention. But, maybe I did? I was sick after Thanksgiving and have pretty much had headaches ever since then. I just figured that it was from the cold that I had (sinus congestion and all) and/or the weird weather we have been having. I don’t know what is causing my headaches and neither does anyone else. There is no point in speculating. I guess I was just a little shocked when everyone I interacted with at UCLA’s Oncology Department seemed to immediately react to my telling them I am having headaches. So, scans soon. I had some insurance related issues to deal with today (payment and authorizations). In the process I spoke with my case manager and he was surprised to hear that I was back to work full time. My oncologist also seemed surprised. I guess I don’t really know what I am supposed to be doing. Nobody told me anything about when to return to work. I just assumed that it was the thing to do. I worked when I was going through treatment until I could not work. And now that I am done with treatment it seems that I should be back to work. Maybe I need to take it a little easier. But, I am anxious to get my business back on track and to be back out there. I need it for many reasons, not the least of which are financial reasons. But, there is also the desire to return to a normal routine and that means working. But, so much is really not normal. Daily headaches, limited energy and difficulties concentrating and completing tasks . . . not normal. And, now that I am back on Tamoxifen, I have nausea which lasts a few hours each day. I am hopeful that as I am on Tamoxifen longer that these side effects will lessen. I am splitting the dose up over the day so that it doesn’t hit me all at once. This seems to be easier to tolerate. I take half at about 3:00 pm after I have completed most of my day and then I take the other half dose about midnight. At the moment, I get sick for a few hours after taking it. But, the dose that I take at midnight doesn’t seem to really affect me as much because I am not sitting up or walking around. So the dizziness and nausea is not so noticeable. The goal is to sleep through the side effects – at least the side effects of the midnight dose. Sometimes that works pretty well. Last night I was up until 4: 30 in the morning. Then I slept until 7:30 and got going for the day. Not enough sleep. But, I am hopeful that I will get on a better routine. I have a feeling that the real reason I did not sleep last night was simply being anxious over seeing my oncologist today. I kept playing over different scenarios in my head. In none of the scenarios did she ever reassure me about the headaches. And, I knew that she would not reassure me. It isn’t her style to placate me. She speaks the truth. I know as much as she does that she can not tell me why I am having headaches. She can only order scans. So, that is where I am at . . . kind of foggy with a chance of stormy weather ahead . . . but really hoping that I get sunny skies. I really appreciate your continued prayers. It means a lot to me. Thursday I have an appointment with the Rockstar, Dr. Sara Hurvitz. She is my oncologist up at UCLA. She works side by side Dr. Slamon, the doctor who developed Herceptin. I feel very fortunate to have her as my oncologist. As much as I enjoy her, it is always pretty nerve racking to go see a cancer doctor. I am due to have scans soon. I am waiting to see what Dr. Hurvitz will say/do about my headaches. I am guessing she will order either a CT or an MRI. My primary care physician already ordered a CT scan. But, I really want to have Dr. Hurvitz decide which tests are done. She may agree with my primary physician and order the CT. But, either way, I will get the CT scan or the MRI done as soon as possible. Scans and MRIs are difficult. The experience is a bit more challenging for me now for some reason. I don’t know exactly why, but, it just seems that way. Hopefully I will get good results. Please keep me in your prayers, I greatly appreciate it. And now, a much needed musical interlude . . .
One of my all time favorite songs is “Better Things” by the Kinks. Sometime last year I decided to make it my theme song . . . it just makes me feel good.